You’re probably wondering what Laser-Like means. As its name implies, Laser-Like is exactly what it claims to be; a decoration method that gives the impression of laser-engraving. Pretty simple, right?! 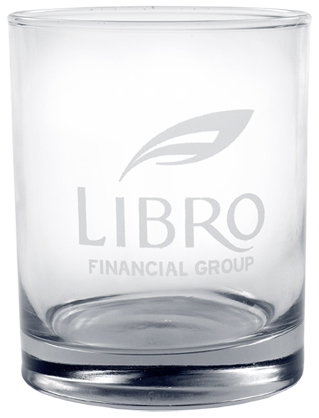 Better yet, with Laser-Like you get the elegance of engraving for the price of screen printing! Using a frosted colour effect, matte ink is applied directly onto the product’s surface using the traditional screen printing technique. The result is an elegant impression that closely resembles the subtle look of engraving. Laser-Like is a subtle decorating option that exudes style and elegance.This is an excellent choice for business promotional products and special events, or more simply, for those who like to add a dash of luxury to each day. 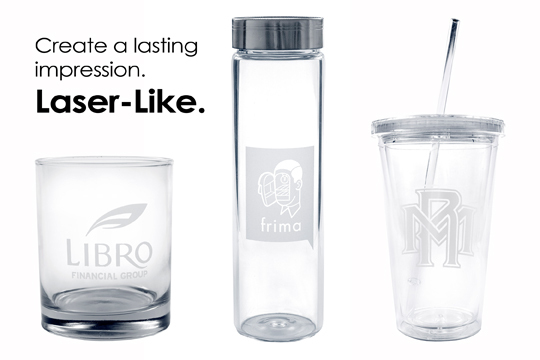 Click here to view all of the drinkware options available for Laser-Like. More styles will become available as our drinkware line expands through the new year. As always, we remind you that you only get one chance to make a first impression. Make it count with memorable promotional products! This entry was posted in Decorating Methods, Drinkware and tagged Acrylic Drinkware, Decorating Methods, Drinkware, Eastman-Tritan, Glass, Imprinting Techniques, Laser-Like by Debco. Bookmark the permalink.